The whole registration is expected to end on May 14 23:59 p.m.
其餘為 2017 年 5 月 14 日下午 11:59 截止. 2015年 Google DeepMind 展示如何在沒有人類干預下，AI自己學會玩50款Atari遊戲，並且超越人類水平。在遊戲中，展示了AI如何探索環境，並透過與環境互動得到的回饋，進行預測，歸納，推理等等的能力。本次教學希望讓學員理解AI如何得到這些學習能力，並透過Google提供的GPU雲端服務，處理學習過程中的龐大運算量，並且部署訓練好的AI來玩超級瑪利歐 SuperMarioBros ! 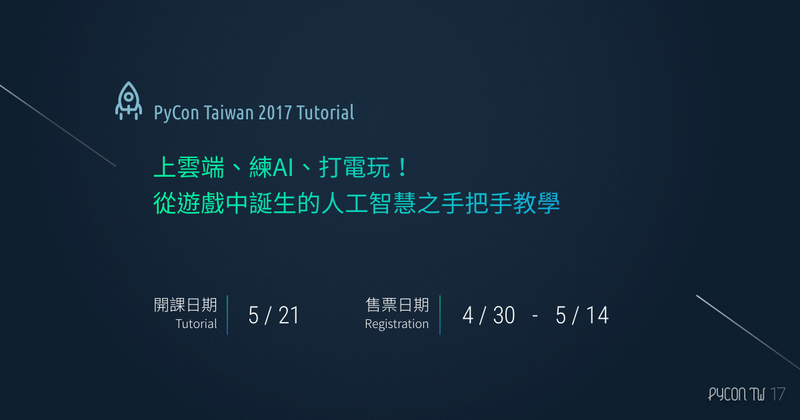 而這場教學也會讓您理解如何透過OpenAI Gym 部署AI到多款遊戲進行操作，例如我們會教您讓AI自己破關超級瑪利歐 SuperMarioBros !